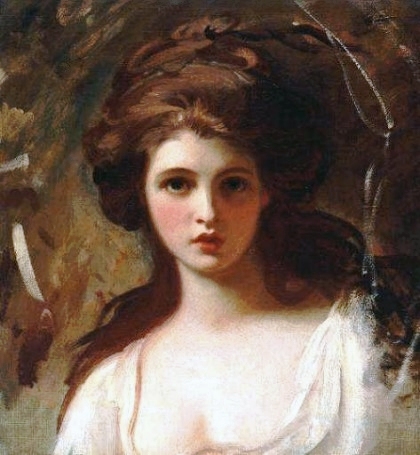 As we noted in our discussion of Countess Ekaterina Skavronskaia, only one living goddess rivalled this legendary beauty for the title of "the most desirable woman in the world" in the late 1700s, and that was the celebrated English rose, Emma, Lady Hamilton. Today, Lady Hamilton is chiefly remembered as the lover of Horatio Nelson--the heroic British admiral who crushed the French navy at the Battle of Trafalgar, thus saving England from invasion, and ensuring Napoleon's downfall. But Emma was also the greatest artistic muse of her time. She was revered as the perfect embodiment of Classical beauty, and inspired the creation of countless artistic masterpieces. Lady Hamilton was also a media celebrity before the mass media even existed, "always . . . surrounded by a crowd of admirers" (Sherrard 90). Wherever she went, "Emma was the centre of town gossip, with her every outing the subject of conversation," and perpetually had "all the world following her and talking of her" (Peakman 60), just as today's Hollywood starlets monopolize public attention. Emma first attracted notice through a dalliance with an English nobleman, and even as an early age, it was apparent to everyone who saw her that she had been blessed with the "beauty that nature bestows but once or twice in a century" (Barrington 31). Her peaches-and-cream complexion, a "velvet skin of lilies and roses" (Barrington 375), endowed her with the fair features that have been revered as the epitome of feminine loveliness throughout history. In her letters, Emma herself marvelled: "I am remarkably fair, that every body says; I put on red and white" (Sherrard 93). She also possessed "long auburn hair (with a hint of gold) and blue-grey eyes" (Peakman 7). Society raved about her "rounded arms" (Barrington 96). But above all, it was Emma's curvaceous form that established her fame. Contemporary accounts tell us that viewers were "much struck with her figure" (Sherrard 136), called "her figure uncommonly fine" (Hudson 82), and "lingered [on] her womanly figure in its flowing white" (Barrington 248). Indeed, the consensus was that "No one can deny Emma's beauty of face and form" (Sherrard 88). Her beauty even moved the Bishop of Derry to declare that "God was in a glorious mood when he made Emma" (Barrington 5). Emma's allure was so extraordinary that the noted portraitist George Romney was commissioned to capture her beauty on canvas. The moment that he laid eyes on her, Romney was spellbound--so much so, that he spent the rest of his career immortalizing her beauty in one painting after another. The artist "was patently in love with his model," Romney's biographer records, but "it was a worshipful obsession on Romney's part, with Emma, like Dante's Beatrice, as the focus of his inspiration" (Cross 121). However, Emma was no lifeless mannequin. Her natural flair for dramatic expression made her "a collaborator, rather than a passive model" (Cross 121), a co-creator of her own artistic legacy. Significantly, Romney's attentions also increased her awareness of her own allure: "His interest flattered her vanity, especially as it was exciting for her to see her beauty appearing on canvas" (Cross 121). Emma's vanity was considerable--as is that of any true goddess--and over time, her vanity grew in proportion with her beauty, making her even more desirable. History records that "she was perfectly well aware of her own beauty" (Sherrard 33); furthermore, that "flattery was as necessary to her as the air she breathed" (Russell 66), and that she had "an incessant need to . . . be admired" (Simpson 80). "as if I was the most perfect beauty in the world"
"I heard the Abbe say to the others I was perfectly beautiful"
Another characteristic that Emma shared with every true goddess was a delight in being pampered and spoiled, and a craving for "living the good life"--the life that she knew she deserved. She found the means to do so in the person of Sir William Hamilton, the English Ambassador to Naples--and the man who would ultimately marry her, giving her the title of Lady Hamilton. 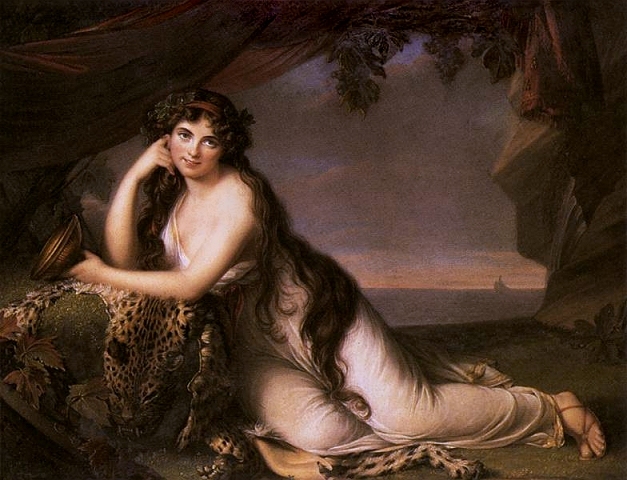 After becoming Lady Hamilton, Emma grew deliciously "capricious, spoilt and extravagant" (Sherrard 12), relishing a lifestyle that allowed her to be "petted and spoilt, living in magnificence and careless of money" (Sherrard 321). This passion, too, continued throughout Emma's life. In preparation for a visit from Emma, Nelson left the following instructions with his household: "See to it, Fanny, that there is a good table for Lady Hamilton is used to the best of everything, and especially good food" (Hardwick 161). 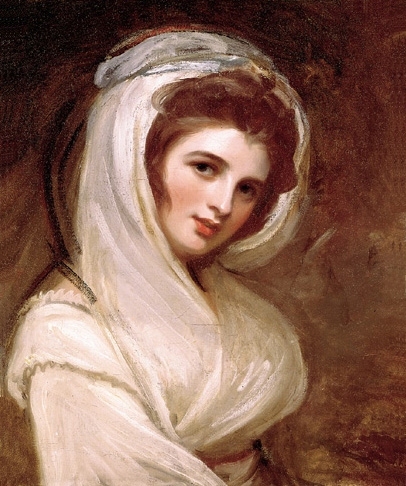 Inevitably, Lady Hamilton became more curvaceous by virtue of her self-indulgence: "Emma expanded daily in the atmosphere of warm caressing admiration which was her soul's delight" (Barrington 101). Visitors noted that she "appeared to be growing every day--in all directions at once" (Simpson 80). But because this was the 18th century--a time when opulent, well-fed beauty, rather than emaciation and androgyny, represented the dominant ideal of feminine appearance--Emma's increasingly generous curves did not lessen her reputation as the most beautiful woman in Europe. Quite the contrary. 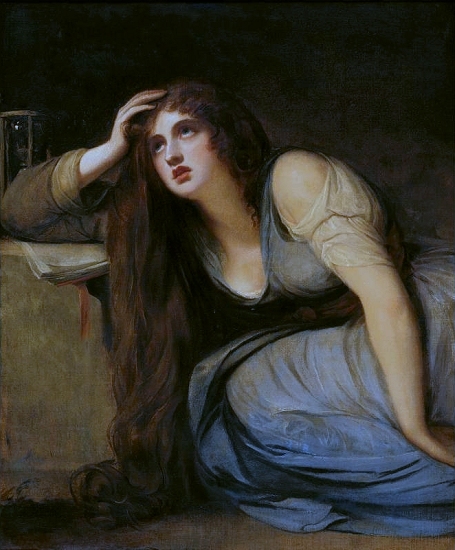 The terms used to describe her allure changed ("She had put on weight and was now more a goddess than a nymph" (Hardwick 44)), but the appreciation of her looks was just as ardent. Sir William Hamilton advised a friend who would be seeing Emma again after an interval of several years that she was "beyond description beautiful and striking and I think you will find her figure much improved since last you saw her" (Barrington 217). A certain Lady Elgin enthused that, "She looked very handsome at dinner, quite in an undress;--my father would say, 'There is a fine woman for you, good flesh and blood'" (Peakman 103). Visitors referred approvingly to her "large commanding figure" (Barrington 378), her "Olympian" figure (Hardwick 72), noting how remarkably "well-proportioned" it was (Simpson 158), and ardently praising its beauty: "She wore a dress of cloth of gold falling in supple splendour about her imperial figure and diamonds in her hair and about her neck" (Barrington 341). In keeping with the eternally-recognized truth that weight gain is the best preserver of youth, Lady Hamilton's increasingly rich features also gave her a perpetually girlish quality, even well into womanhood. One visitor to the Hamiltons' Neopolitan villa concluded from her appearance that "She is four- or five-and-twenty in the bloom of youth," at a time when Emma was actually thirty-two (Hudson 103). Far from diminishing her allure, her sumptuous curves won her renown as the living embodiment of Classical beauty. 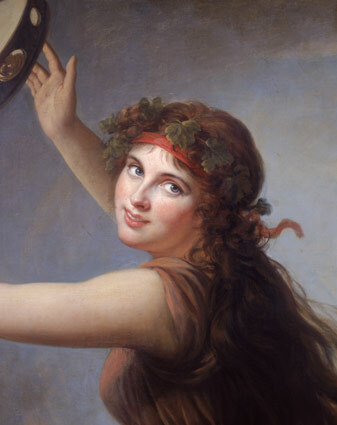 Long before plus-size models brought the Classical ideal back to life in our own day and age, Lady Hamilton revived the feminine aesthetic of Antiquity for her own time. She was revered as "a Roman beauty, opulent, luxuriant, dominating, the perfect classic re-animated for the rapture of the eighteenth century" (Barrington 101). A famous nun visiting with Emma told her, "Your figure and features are rare, for you are like the marble statues I saw, when I was in the world" (Sherrard 114). Some contemporary observers even considered her beauty superior to the Classical past. According to William Locke, "all the statues and pictures he had seen were in grace so inferior to her, as scarce to deserve a look" (Sherrard 136). No one revered her Classical qualities more than did her besotted husband, Sir William Hamilton. 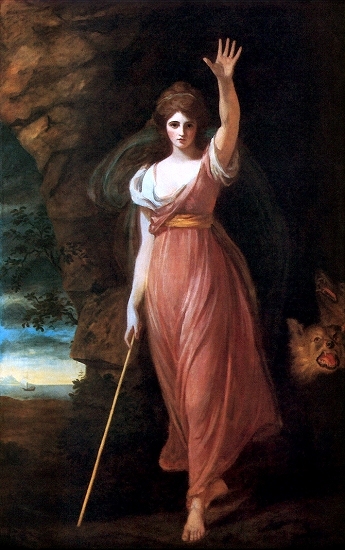 A collector of Greek antiquities, and a scholar of some note, Hamilton conceived of Emma as Helen of Troy for the 1790s. "She was Hamilton's living embodiment of ideal Greek beauty," history tells us, "the Galatea to his Pygmalion, whom he regarded with the eyes of a connoisseur and who became his own living work of art" (Jenkins 84). Emma's increasingly curvaceous figure was particularly adored by Hamilton. As Emma notes in another letter: "He thinks I am grown much more handsome than I was, he does nothing all day but look at me and sigh" (Sherrard 86). True connoisseur of art that he was, Hamilton wanted the entire world to marvel at Emma's appearance. Emma records that "Sir Wm. is never so happy as when he is pointing out my beauties to [his friends]" (Sherrard 86). Hamilton veritably made it his life's mission to preserve Emma's image for posterity. He refurbished a room in his villa as a painter's studio, where artists from across Europe came to immortalize Emma in every artistic medium--paintings, sketches, marble, etc. "There are now five painters and two modellers at work on me for Sir William," Emma notes in her letters, "and there is a picture of me going to the Empress of Russia" (Sherrard 122). Although Emma had an insatiably sensual nature, and a Classically voluptuous figure, her soft, angelic facial features simultaneously gave her beauty a spiritual quality. In this, she belonged more to the Renaissance than to Antiquity--a harmonious blending of Christian and Classical principles. Emma herself particularly responded to this assessment of her appearance. In her letters, she recalls how Hamilton once told her that "if he did not feel and see and know that I am a substance, he would think I was an angel" (Sherrard 122). One visitor informed Emma that God was "so good as to make your face the same as he made the Blessed Virgin's," and in another case, Emma relates how "two priests came to our house and Sir William made me put the shawl over my head and look up, and the priest burst into tears, and kissed my feet, and said God had sent me on purpose" (Sherrard 125). 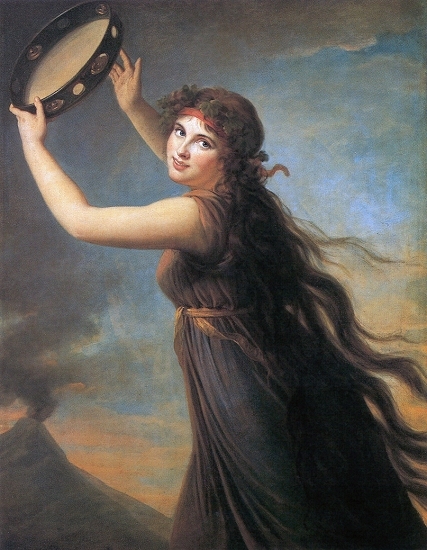 Emma merited her reputation as a "living work of art" not only by virtue of her Classical beauty, but also because she devised a unique form of performance art, one involving brief scenes of acting and dancing, which became famous throughout Europe as "Lady Hamilton's Attitudes." series of theatrical mimes and poses in which she represented various figures from classical literature, myth and history . . . 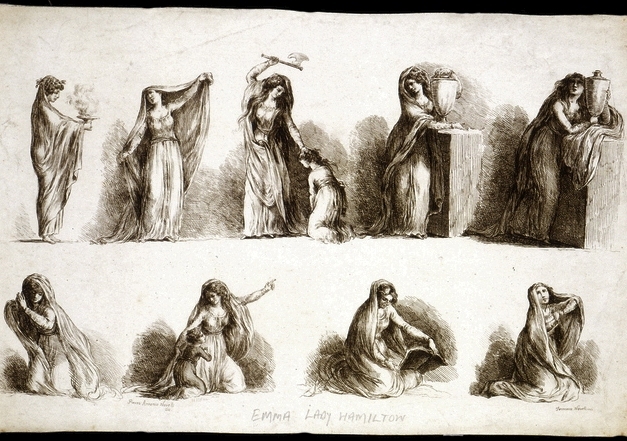 While performing her 'attitudes', Emma created a living gallery of statues and paintings by clever manipulation of her long shawl, her pose and facial expression, and the use of props, such as a vase. She acted a succession of characters, for example from a Roman maiden making an offering, to a devotional saint, to the classical figure Medea slaying her child. The audiences - connoisseurs and Grand Tourists - for whom Emma performed her poses, would all have recognised the various characters familiar to them in the form of classical sculptures and in depictions in Old Master paintings. Her audiences were profoundly impressed both by how she seemed able to bring to life the characters shown in famous works of art and the emotional intensity she conveyed in a performance. With this deft use of poses and facial expressions, and the manipulation of her wardrobe, what Lady Hamilton was actually doing while performing her Attitudes was . . . modelling (long before fashion modelling even existed). In a very real sense, then, she deserves to be regarded as the world's first plus-size model. 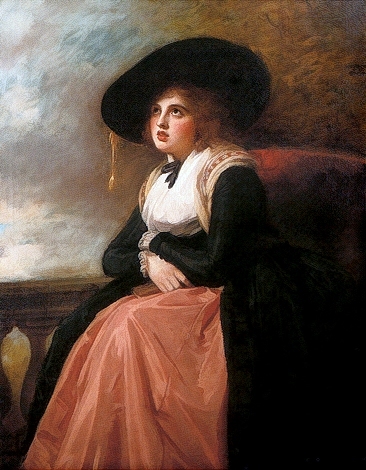 Not only was Emma the predecessor of today's plus-size models in the fact that her figure exhibited Classical proportions, and that she employed modelling techniques in performing her "Attitudes," but also because "Emma's pictures had a bearing on the trend of fashion" in her time (Sherrard 33), and effectively became the Vogue magazine of the day. Anticipating elements of today's "New Femininity" in fashion, Emma popularized longer hairstyles possessing "voluptuous volume," and an avoidance of any body-constricting "shapewear" ("stiff, long-waisted stays"), instead preferring gowns that were body-conscious, and closely embraced her generous curves. One infatuated observer enthused how "the thin white shirt clung to her opulent figure" (Hardwick 54). And Emma herself recorded that during one soirée, "though I was in an undress, only having on a muslin chemise very thin, yet the admiration I met with was surprising . . . all allowed they never had seen such a belissima creatura in all their life" (Sherrard 120-21). In his Encomium of Helen, the Roman orator Isocrates describes how the beauty of Helen of Troy was the genesis of Greek civilization, in both its artistic and martial aspects. On the one hand, "she stood over Homer at night and directed him to write about those who had campaigned against Troy," thus giving birth to Classical literature and art, and on the other, "it is owing to Helen that we are not the slaves of the barbarians. For we shall find that it was because of her that the Greeks became united in harmonious accord." Helen was the ideal that gave Classical civilization form and purpose. Emma likewise inspired both the art of her time, and the military salvation of her country. 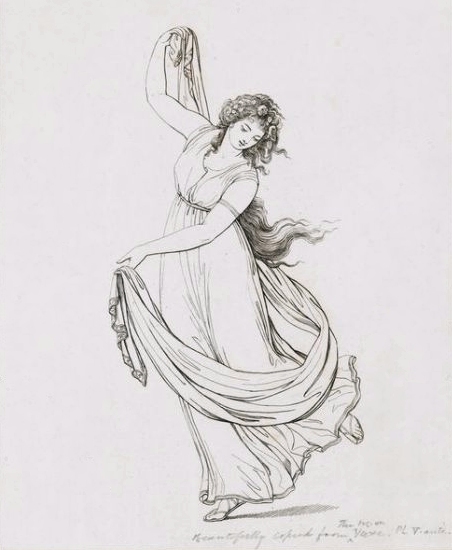 Her marriage to Sir William Hamilton resulted in a comprehensive artistic record of her beauty, which propagated a Classical revival; while her relationship with Admiral Nelson motivated England's great protector to vanquish Napoleon's forces on the high seas. Nelson himself once declared that "If there were more Emmas there would be more Nelsons" (Sherrard 327), thereby providing a fitting epitaph for this English Helen of Troy. Perhaps today's plus-size models can become the Helens of Troy, or the Lady Hamiltons, of our own time, giving our rudderless culture its bearings, and restoring its sense of itself. Barrington, E. The Divine Lady: A Romance of Nelson and Emma Hamilton. New York: Dodd, Mead and Co., 1925. Cross, David A. A Striking Likeness: The Life of George Romney. Aldershot, UK: Ashgate, 2000. Fraser, Flora. 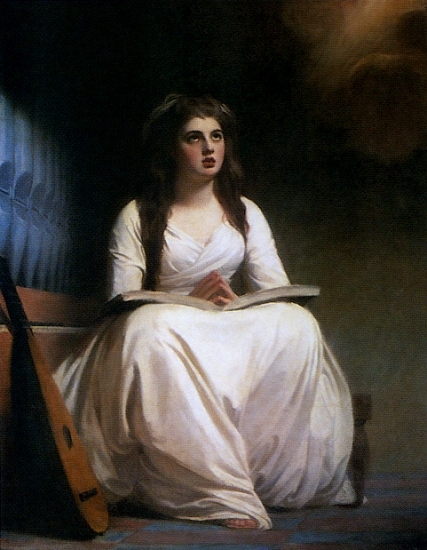 Beloved Emma: The Life of Lady Hamilton. London: Weidenfeld and Nicolson, 1986. Goethe, Johann Wolfgang von. Italian Journey. Trans. Robert R. Heitner. Eds. Thomas P. Saine and Jeffrey L. Sammons. Goethe: The Collected Works 6. Princeton: Princeton UP, 1989. Hardwick, Mollie. Emma, Lady Hamilton: A Study. London: Cassell, 1969. Hudson, Roger, ed. Nelson and Emma. London: The Folio Society, 1994. Jenkins, Ian and Kim Sloan. Vases & Volcanoes: Sir William Hamilton and His Collection. London: British Museum P, 1996. Peakman, Julie. 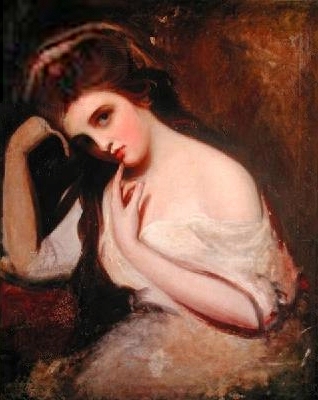 Emma Hamilton. London: Haus Publishing, 2005. Sherrard, O.A. 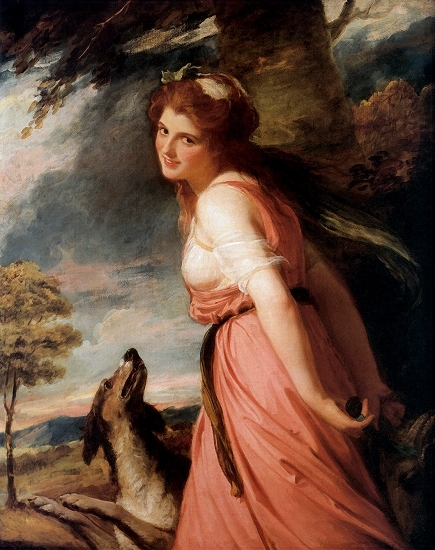 A Life of Emma Hamilton. London: Sidgwick & Jackson, 1927. Simpson, Colin. Emma: The Life of Lady Hamilton. London: Bodley Head, 1983. Russell, Jack. Nelson and the Hamiltons. London: Anthony Blond, 1969. Last edited by HSG : 31st December 2006 at 20:04. Yes, Lady Hamilton was the equivalent of a paparazzi darling in her time. But how different her example was, from the example provided by the tanorexic celebrities of our own day and age! Whereas modern celebrities encourage women to punish themselves with starvation and exercise-torture, the celebrities of past centuries showed women that they could embrace their natural figures, and eat whatever they liked -- and as much as they liked. Sir William Hamilton advised a friend who would be seeing Emma again after an interval of several years that she was "beyond description beautiful and striking and I think you will find her figure much improved since last you saw her"
How remarkable (and wonderful) to experience the attitude towards the female body that prevailed in another time -- a saner and better time than ours, a time when a woman's beauty was considered "much improved" when her figure became fuller. 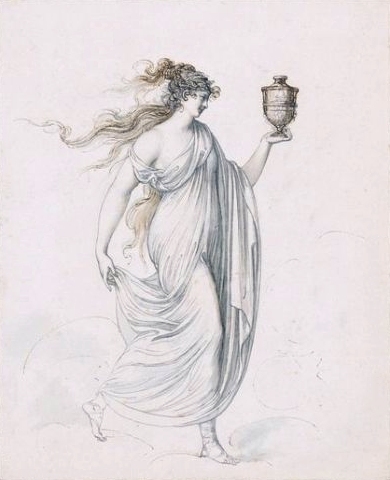 In addition to the Helen of Troy comparison, I think one could also liken Lady Hamilton to Venus, the goddess of beauty. Venus was romantically involved with both Vulcan, the artificer, and Mars, the god of war. Those two neatly parallel the roles that Sir William Hamilton, the classicist, and Nelson, the warrior, played in Emma's life. We have discussed how Lady Hamilton influenced the arts of painting and sculpture, and even created an art form of her own--her "Attitudes," which merged acting, dance, and posing into a unique form of aesthetic performance, similar to present-day fashion modelling. What is less widely known, at least in English-speaking countries, is the extent of her influence on literature. 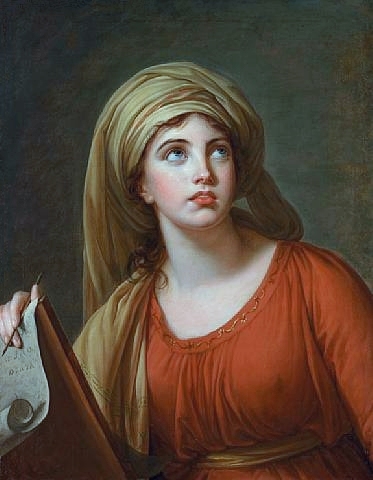 Lady Hamilton was the prototype for the title character of Madame de Staël's Romantic novel, Corinne. (De Staël describes Corinne as having a "tall, slightly plump figure, in the style of a Greek statue.") And, as we have already noted, she features prominently in Goethe's Italian Journey. However, of all major writers, none was as deeply enamoured of Lady Hamilton as was Alexandre Dumas, père (1802-1870), the author of stirring adventure tales which are still read throughout the world, such as The Count of Monte Cristo, and The Three Musketeers. Dumas penned no less than three novels in which Emma plays a part, and in the last of the three, Souvenirs d'un favorite, she is the book's central figure. However, only the first two Dumas novels involving Lady Hamilton have ever been translated into English. Dumas's portraits-in-words of Emma are utterly captivating. This living muse exerted as potent an influence on men of letters as she did on painters and sculptors, and Dumas's rapturous prose testifies as vividly to Lady Hamilton's beauty as do Romney's impassioned brushstrokes. When one tired of examining her in detail, each new phase was a successive dazzlement. The chestnut tresses wound around a countenance like a girl in her teens. Only those who participated in the queen [of Sicily]'s private evening parties, in which "Emma Lyonna" was the great charm and principal ornament, could relate to what height the modern Armida lifted her beholders in delirium and enthusiasm. If her magical poses and voluptuous pantomime had deep influence on northerners, how much more must they have electrified the violent southern imagination impassioned with song, music and poetry, and knowing Cimarosa and Metastasio by heart? It is admitted that lady Hamilton was lovely. What must she have been on this evening, when she wished to bewitch Nelson and outshine the belles in their elegant costumes? Faithful to her traditions of liberty and art, Lady Hamilton wore an attire which, though novel, was to be adopted by all the beauties. A long tunic of blue cashmere fell in those folds only seen in antique statuary; floating over her shoulders in long wavy tresses, her hair threw off the reflections of melting gold . . . Her arms were bare from the shoulder to the finger-tips; but one arm was clamped in at the top and wrist by serpents in diamonds with ruby eyes; one hand was loaded with rings, while the other, on the contrary, shone solely with the brightness of the fine skin and the luster of the pink nails. . . . The sheer, overwhelming allure of Lady Hamilton's well-fed beauty and self-indulgent nature compelled the luminaries of her day to devote their energies to gratifying her limitless desires. She was a muse in the truest sense of the word, a goddess who inspired artisans to hone their talents to the highest, to immortalize her intoxicating presence for all eternity. When our culture once again recognizes the timeless beauty of its Emma Hamiltons, it will also bring forth more Goethes, Romneys, and Alexandres Dumas. And when that happens, the arts of the West will blossom once more, like an orchard in spring. Dumas, Alexandre. The Lovely Lady Hamilton ("Emma Lyonna"); or, The Beauty and the Glory. Trans. Henry L. Williams. New York: Street & Smith, 1903. Trans. of La San Felice. 1863-65.